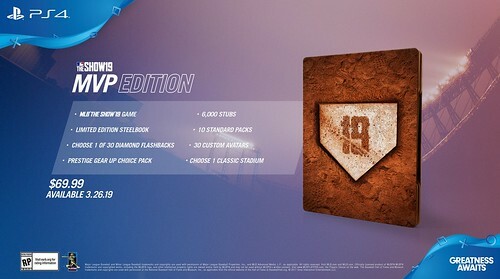 Continue on to see the first MLB The Show blog detailing information on the pre-order bonuses and various versions of the game. Bryce Harper is one of the biggest names in baseball, and he’s got the stats to show for it: 184 home runs, 521 RBIs, Six-time MLB All-Star, 2012 NL Rookie of the Year, 2015 NL MVP––the list goes on. But as free agency has begun, the world is left wondering: where will he be in 2019? 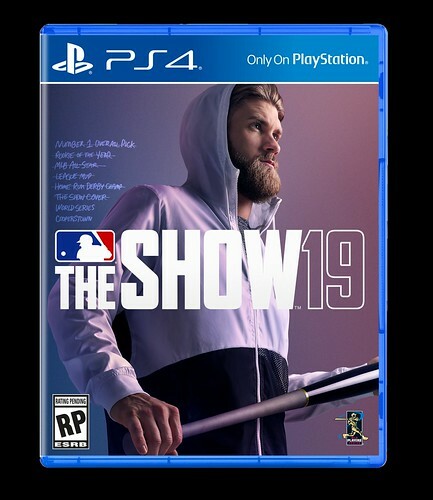 We’re proud to announce Bryce Harper as the cover athlete of MLB The Show 19, and we are excited to partner with him for the reveal of his ‘2019 team on our upcoming final game cover art. Bryce’s unapologetic raw passion for the game and search for a potential team makes him the player to watch this off-season. We’re at the beginning of a new chapter in the epic MLB legacy of Bryce Harper. He’s got the skill and tenacity to be a hall-of-fame ballplayer. He’s got an explosive drive to win, and he’s hungrier than ever for a World Series ring. So, what jersey will Bryce champion on the final cover of MLB The Show 19? Follow The Show to see what the future holds for baseball’s most exciting free agent and what jersey he’ll be wearing on The Show 19. Get ready to smash it out of the park! 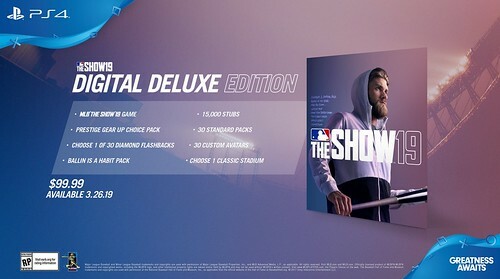 MLB The Show 19 launches on March 26, 2019 The Standard Edition is $59.99 USD (MSRP) / $79.99 CAD (MSRP). Pre-order now and be ready for action. When you pre-order, you will receive 10 Standard Packs and 1 Gold Player Choice Pack for The Show 19 when you pick-up or download the game from any participating retailer. Pre-order at GameStop and receive an additional 1 Gear Up Choice Pack. 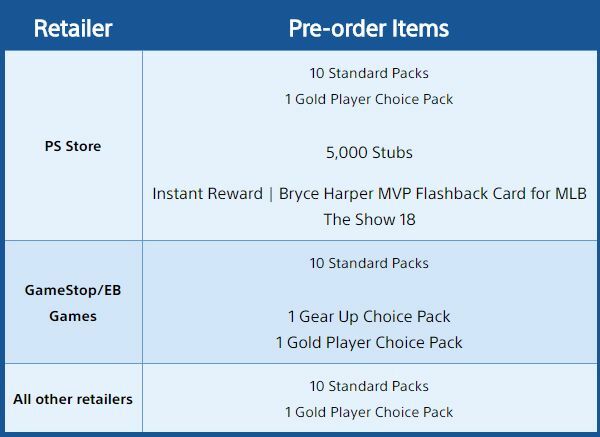 Lastly, if you pre-order on PlayStation Store, you’ll also get 5,000 Stubs for MLB The Show 19 and INSTANTLY receive an Bryce Harper MVP Flashback Card you can use right now in MLB The Show 18. How about something shiny and new? This year we wanted to create a truly unique collector’s edition baseball hat. To do so, we’ve partnered with New Era once again to create a limited Gone Yard 9FIFTY commemorative snap back cap. Pre-order now, because quantities are limited! 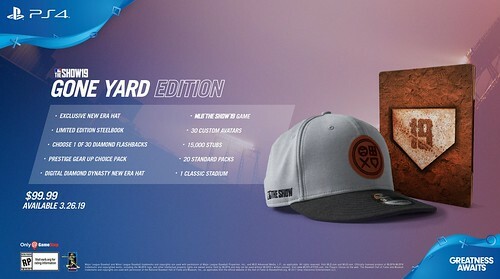 The Gone Yard Edition is $99.99 USD / $129.99 CAD (MSRP). For our biggest digital fans, we are bringing back the Digital Deluxe Edition for ’19, at the PlayStation Store. The Digital Deluxe Edition is $99.99 USD / $129.99 CAD (MSRP). For those of you that need packs on packs on packs, this is the edition for you. The gamer’s favorite MVP Edition is back for another year! This $69.99 USD / 89.99 CAD (MSRP) edition not only includes a ton of digital goods, but also the limited edition Steel Book (physical version only). It’s available for Pre-Order now at retail and on the PlayStation Store. This is an especially exciting year for us here at PlayStation. We’re thrilled to welcome a new class of Legends to the team, including some all-time greats, and even more excited to show what else we have in store for you in The Show 19! In the meantime, please make sure to watch The Show Nation, our Twitter, Facebook, and Instagram accounts between now and March 26th for the latest updates.